Halo Diamond Engagement Ring in 14k Rose Gold | Shane Co.
Halo Vintage Matching Sets Solitaire Classic Three Stone Preset Rings New Arrivals Learn more about styles. Find the engagement ring that matches her style. Four generations of superior quality, value and service. Enter your email to log in or create an account to view the favorites that were shared with you. Enter your email to log in or create an account. Please check your email for directions to activate your account. Enter your password to log in. Please check your email for directions to reset your password. Welcome to ShaneCo.com. We are proud and pleased to offer an opportunity to experience Shane Co. on-line. As an employee or immediate family member, please read and agree to the following terms and conditions of the WSM employee purchase agreement. As stated in the WSM Company Handbook, "employees may purchase merchandise at a reduction from normal selling price, provided that the merchandise is solely for either the employee's own use or for that of his or her IMMEDIATE family." Immediate family is defined as follows: Employee's spouse, spousal equivalent, daughter, son, mother, father, sister, brother, grandparent, grandchild, mother-in-law, father-in-law, son-in-law, daughter-in-law, brother-in-law, sister-in-law, step-parent, or step-child, or a person who is legally acting in one of the above capacities, or another relative living in the employee's residence. Employees are eligible for the employee discount privilege after receipt of their first pay stub from Western Stone & Metal. I understand and agree my password is unique to me and cannot be shared with anyone. I agree I will not purchase any merchandise for the purpose of resale. I agree I will not purchase any merchandise in proxy for others. I agree I will not distribute or share, and will keep the employee price confidential. Any misuse of this employee benefit will result in the loss of such benefit to the employee and all qualified family members stated above, as determined by the VP of Human Resources. Any employee violation, or violation by a family member, of the Company's EMPLOYEE PURCHASE POLICY, Section IV-L of Company Handbook could result in progressive counseling action being taken with the employee up to and including termination. We need just one more thing to complete your account! Please confirm your first and last name for your account. Your session has expired. Please click OK to reload the page. Your message is on its way! All fields are required unless marked "Optional"
To contact a store directly, please visit the Store locator . Removing this item will remove any customizations you have made. Are you sure you want to remove these items? Are you sure you want to remove this item? If you remove/replace your diamond you will have to choose your fantasy head again. Would you like to continue without a fantasy head? Conveniently determine your ring size using our downloadable Ring Sizer. When you print the ring sizer, you must set the Page Scaling to 'None' in your printer dialog box. Otherwise, the ring sizer will not print to the correct scale. Don't See Your Ring Size? Call our jewelry experts at 1(866)-467-4263 to see if it's available for special order. Custom sizes can deliver in 6-8weeks if available. Free Lifetime Ring Sizing from Shane Co. Your rings will always fit perfectly when you buy from Shane Co. because our Free Lifetime Warranty includes complimentary ring sizing for life. No one takes care of your jewelry like Shane Co.
Due to the nature of engraving, once this item has been engraved, it cannot be returned. Sorry but this product is unavailable. Leaving this page will lose your progress. Click the heart to save this to your Favorites. The 0.50 carat round diamond of your choice will beautifully complete this ring, as part of our exclusive Eternally Yours collection. This setting was created to hold your chosen diamond flush within the halo of 58 round diamonds, at approximately .40 carat total weight. 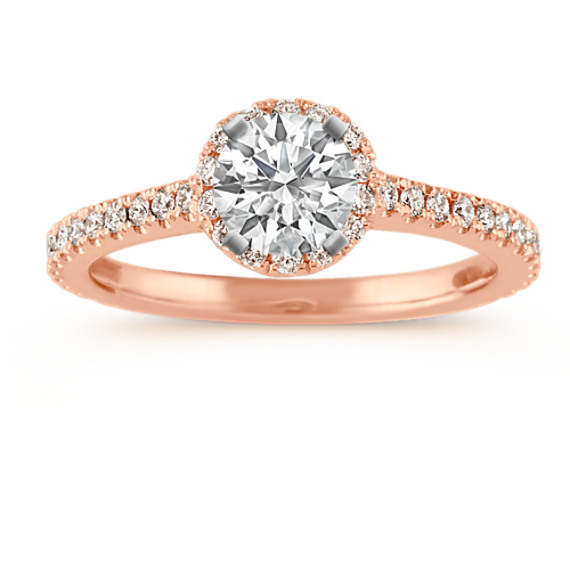 The diamonds have each been hand-selected for maximum fire and are pavé-set in quality 14 karat rose gold. Look to the profile of this amazing setting to see the accent of diamonds along the bridge of the ring. Gemstone Carat Weight :3/8 ct. t.w. Including jewelry cleaning, inspection, maintenance and repair, free for life. We want you to be sure you’re 100% satisfied with your Shane Co. jewelry. Your jewelry comes beautifully gift-boxed, complete with a hand-tied ribbon. Some orders may ship same-day. Make sure to check your estimated delivery date if your order is extremely time sensitive. In the interest of security, some FedEx orders require a signature at delivery and will not be dropped off unattended. *The Estimated Delivery Date is determined by the availability of the items at the time you placed your order and by the time required to process your order. No applications, no contracts, no interest or fees. 100% refundable and returnable. Conveniently stretch out your payments with the Shane Co. Credit Card. Choose the financing term that’s right for you. A convenient line of credit to pay for purchases now or at a pace that meets your needs. Pearls can keep their luster for a very long time, when cared for. Proper pearl care is not difficult, as long as you remember that these gems are organic by nature, grown in water from living cells of a living creature. The best way to help your pearls maintain their luster is to wear them regularly. Your body's natural oils aid in maintaining the pearls' beauty. Pearls should be worn alone. If worn with other jewelry, such as a gold chain or other necklace, they may be scratched or damaged. Apply any cosmetics, lotions, perfume or hair spray before putting on your pearls. Make your pearls the last item you put on when getting dressed and the first item you take off. Avoid contact with salt water, chlorinated water, or perspiration. Wipe your pearls after wearing them, using a soft cloth. Remove spills immediately when pearls come in contact with any foods or liquids. Wipe them with a soft damp cloth and then with a dry soft cloth. Store your pearls separately from other jewelry, preferably in a cloth bag. Storing them in a slightly damp linen cloth will help the pearls from drying out in low humidity atmospheres and centrally heated areas. Never clean your pearls with soap, detergents, or jewelry cleaner. A harsh cleanser can wear away the nacre. Never use an ultrasonic jewelry cleaning machine or steam cleaner. Have your pearls restrung every two to five years if worn regularly, or when the silk becomes dirty. Take your pearls to a professional jeweler for cleaning prior to restringing, which will add to the beauty and long life of your pearls. Because sterling silver by nature may tarnish, we provide you with a professional cleaning and polishing cloth with your purchase of sterling silver jewelry. The treated inner cloth will restore luster without scratching or removing the finish. This cloth can also be used on your gold and platinum jewelry. Use the inner polishing cloth to remove tarnish or dirt, and finish with a few rubs of the outer cloth to provide a high shine. Alternatively, create your own cleaning solution. Line a bowl with aluminum foil and pour hot, salted water in. Drop your silver jewelry in and move it around with a wooden or plastic utensil to ensure all of the surfaces come in contact with the aluminum foil. When you notice that the metal has become bright again (it should only take a few minutes), remove the jewelry and rinse under the tap. Wipe gently with a towel and polish with a soft cloth. Note that this method should only be used if your jewelry does not contain gemstones as the saltwater could damage the settings. Proper care of your gold jewelry will assure a long-lasting glow. Gold is tarnish-resistant, but it can get dirty or smudged. Every so often, clean your gold jewelry with a mild detergent or ammonia solution (one-part ammonia to six parts water). Avoid ammonia solution when cleaning pieces that contain pearls. Do not use any kind of abrasive material that might scratch the gold. Use a soft brush to gently clean intricate filigree designs and under gemstones. Rinse and wipe jewelry after cleaning. Like gold, platinum jewelry does not tarnish. Simply clean your platinum pieces with a soft cloth and mild detergent or ammonia solution (one-part ammonia to six parts water) to maintain their luster. Clean your diamond jewelry regularly at home in an ultrasonic cleaner or by hand. To make your own jewelry cleaning solution, mix one-part ammonia to six parts water. Gently scrub the diamond piece with a small soft toothbrush to loosen dirt and restore the diamond's brilliance. Be careful not to scratch the metal setting. Always rinse after cleaning. To clean rubies and sapphire jewelry at home, use a lukewarm solution of water and mild dishwashing soap, or one-part ammonia to six parts water. Keep your gems brilliant by gently brushing them with a small bristle brush, especially underneath where dirt collects. Rinse and dry. Something your special someone would love. Get special offers, fashion tips, and more! Copyright © 2000-2019 Shane Co. All Rights Reserved. *Free Shipping applies to all domestic orders. **Product availability varies by store.